Situational Judgement Tests (SJTs) are designed to assess the decision making required for solving problems in work-related situations. This type of test is useful for assessing non-academic, practical intelligence that when used alongside knowledge based tests give a good insight into your ability for a particular job. SJTs present you with hypothetical and challenging situations that as an employee you might encounter at work. These situations may include dealing with work place problems, working with others as part of a team, and dealing with other work related challenges. In response to each situation you are presented with several possible actions and are asked to select the response that you think is the ‘most’ and ‘least’ effective in dealing with the situation described. A competency is a set of defined skills, abilities and personality traits that provide a structured guide which enables the identification, evaluation and development of the behaviours in individual employees. Competencies vary between job types, organisations, and job levels, therefore competency sets will differ depending on the job industry, seniority of the job, and job description. SJTs are designed to gather information about a list of competencies through asking for reactions to specific work related situations. As a result, different questions on an SJT will link to different competencies. 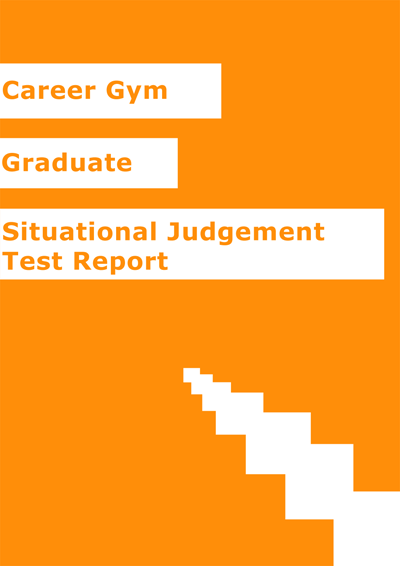 Career Gym SJTs require you to choose the ‘most’ and ‘least’ effective way to respond to the provided situation from the four options given. Two points are awarded for correctly identifying the ‘most’ and ‘least ‘effective options. One point is awarded is awarded if either of the two ‘middle’ options are chosen as the most or least effective, and zero points are awarded for choosing the ‘least’ effective option for the ‘most’ effective question and vice versa. There is no negative marking. For each question you will receive a detailed yet easy to understand explanation of rationale behind the correct ‘least’ and ‘most’ effective options. Career Gym SJTs provide you with an easy-to-use overview of all your previous test sittings with detailed information on the percentage of your correct and incorrect answers and the percentage of questions you did not answer. Furthermore you can get direct access to your saved notes, re-take any of your tests one more time or revise all of your tests as many times as you wish - without limitations. This allows you to consult the solutions and explanations whenever you need to brush up. In the case of SJTs, it may be that you need to focus your attention on a particular competency or situation you have not come into contact with before. Along with the numbers detailing your performance on the SJTs, you will also receive a narrative report identifying your strengths and areas for development in relation to the specific competencies. The detailed explanation of your performance coupled with the numbers and statistics will enable a full picture and clear identification of the specific areas in which you may need further development or those in which you excel.